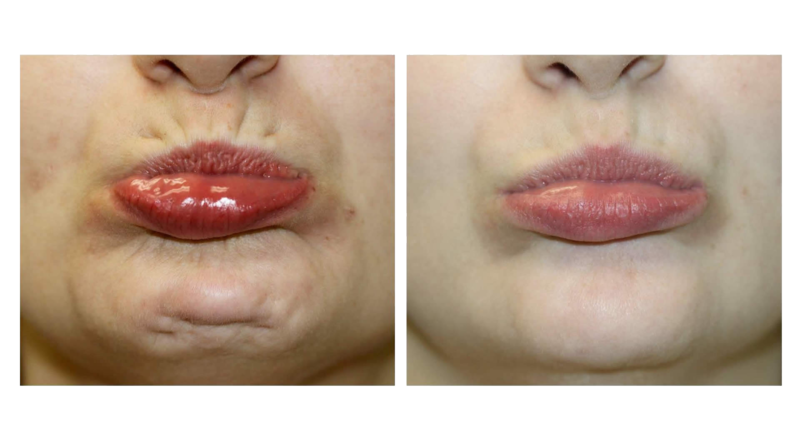 This chin dimpling is created when the muscles beneath the skin of the chin contract and pull the fibrous connections of the overlying skin inwards, creating the illusion of dimpling. Botox injections in this area can help give the chin a softer and less dimpled appearance. Botox can also be used to soften the horizontal mental crease. This is the indentation that appears between the lower lip and the chin. A pronounced crease can also cause a puckering effect around the mouth, which some people feel makes them look older or gives them a “witch-like” chin. By placing a certain amount of units of Botox into the chin, can relax the mentalis muscle and create a smoother look as well. If however the mentalis crease is very deep, it may be necessary to add dermal fillers such as Juvederm Voluma or Teosyal Ultra Deep to augment the crease. Botox can furthermore be used to soften a cleft in the chin. A cleft chin refers to a chin with a Y-shaped dimple in the middle of it. Botox will not fill in the cleft but it will make it less noticeable. Dermal filler such as Teosyal, Restylane or Juvederm would be used to raise the skin in the dimpled area, so that it is in line with the rest of the chin. The effect is not permanent, and eventually the chin area will return to its original appearance, at which time the treatment can be repeated.